So..It’s obviously been a while. Thanks to my shifts at work changing my hockey watching has gone to almost nilch. However, I am being laid off in less than 2 months so it looks like that will be changing. Hopefully I can return to blogging about those lovely Stars (who refuse to make the playoffs anymore it seems). I do miss it. And congrats to the LA Kings for winning their first Stanley Cup EVER! So it’s been a while, a long long while at that. But such debauchery has occurred that I can not keep quiet. So. Here’s how this works Joe. If Mike Modano loses a leg in an awful accident and asks to play, you give him a contract. The end. So here’s where the team stands: No Russians, One goalie with a history of injures, and no Mo. 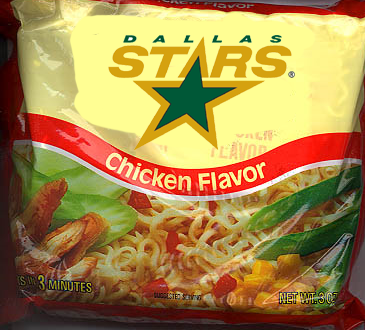 Welcome to the Stars team that lives off of Ramen ladies and gentlemen. They are grasping for straws. For those who have been living under a rock, there is currently a campaign to help save the Duncanville Stars Center. You can visit the site at SupportDuncanvilleRink.com . There are a lot of kids who use this rink and that means a lot of kids will be without this fantastic sport. Please show your support, visit the website and see what you can do to help. After 17 years with the NHL, Philippe Boucher has decided to call it quits. He was an extremely loved player in his time here with the Dallas Stars and the NHL is going to be without one fantastic defenseman. Summer is here, and I have become extremely lazy when it comes to keeping up with things other than work or World of Warcraft. As much as I love hockey, I sadly am not that excited for this upcoming season. This last season really hurt my hockey loving heart. And with the losses of Tippett, Midget, Russian, etc… I am less than ready for this next season to start. Let’s add to this the fact that Heika is now reporting that there will be no icebreaker this season. Um wut? Let’s just add this to list of ‘reasons the 09-10 hockey season won’t exist’. Stars have extended an offer to Fishsticks, which makes me extremely happy. But not as happy as them signing Jere Lehtinen to a 1-year deal. Thank God. I have been having nightmares about a lack of finns on this team. The Stars officially announced today the firing of Dave Tippett and the hiring of new head coach Marc Crawford. Mark Lamb has also been given the boot. I make it no secret I was a big fan of Tippett, but I will give Crawford a chance. The numbers, however, aren’t too uplifting. He was fired by the Kings in 2008, so he was not coaching during the 08-09 season, so here are the compareable numbers between both coaches between the 02-03 and 07-08 seasons. That is a big difference. The one thing he has going for him was winning a Stanley Cup, which Tippett has not done. But that was also in 1996, 13 years ago. I’m going to admit, I am definitely a tad worried about this upcoming season. But here’s hoping that Crawford can prove me wrong in thinking he was a bad choice for coach. What in the world. Are you people thinking. TSN reports that the Dallas Stars have fired coach Dave Tippett. So, one big move has been made already this off-season, the Stars now have a new General Manager; the fan favorite Joe Nieuwendyk. I can’t say I’m not sad about this, as much as I think Jackson was fantastic as the GM job Brett Hull was definitely not. Now, make us proud Nieuwy and get Zubov and Lehts signed k?